My name is Bethany, and I’m a Hater. But, I wasn’t educated. I was basically being a really nasty Hatecist. Blindly hating something I knew nothing about. So, on Sunday, I rolled out of bed, put on a hat, did not brush my teeth or put on a bra, and I drove on over. OH, judge me all you want, but I was going to Taco Bell, not Buckingham Palace. My bestie Anna recommended the steak burrito. She and her hursband Kevin are big proponents of the Bell breakfast. Kevin pretty much has his PHD in egg cookery, so I can trust them. She also said that the waffle taco was worth trying as a second item. 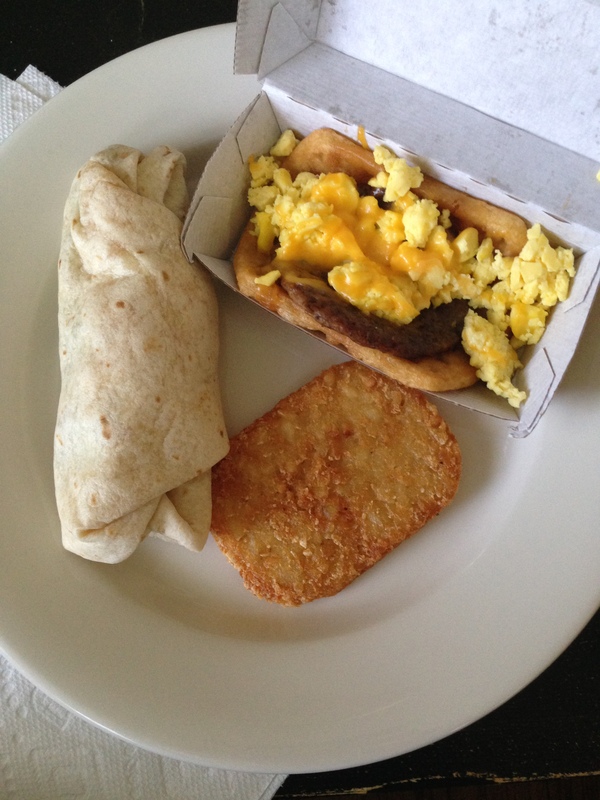 Since #yolo, I got a steak burrito, a waffle taco with sausage, a hash brown, and a juice. No, I didn’t eat them all. Stop your body fascism. I can have two things if I want. Mornings will never be the same, so they CLAIM. I didn’t touch the juice cause it seemed a fake color orange. Like if you melted down a bunch of Atomic Tangerine crayons and put them in a bottle. So, wasted that. CHECK. Being an adult. CHECK. The hash brown was pretty standard. It wasn’t very greasy, but it didn’t have much potato inside. I’d call it a draw. The steak burrito was pretty good, all things considered. I dipped it in ketchup (normal) and then I dipped it in the leftover syrup from the Waffle Taco (went rogue!). Salty sweet situation. It was kind of weird and….kind of great. Am I still a Taco Bell breakfast Hatescist? No. The Hatecism that was in my heart has been removed, bit by sausage-y bit. And the holes that were there have been plugged up with the grease from the burrito and waffle taco. Because Hatecism may not kill, but high cholesterol does.